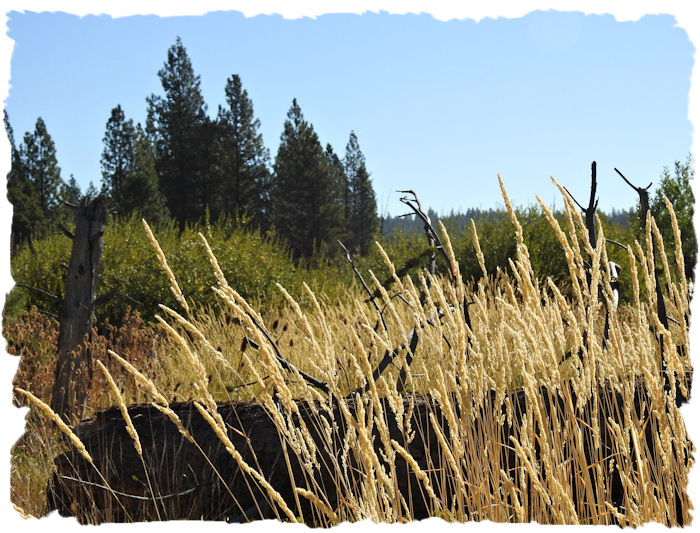 September 2018 we decided to go exploring in eastern Shasta County. Primarily we were looking for additional locations where I could photograph (or attempt to photograph) a variety of birds. After packing our picnic, we looked over a BLM map of the general area. First we drove to Burney and attempted to find a route over to Lake Margaret, which is northwest of Burney. Our first attempt ended up in someone's yard, though I did get s couple of nice photos of pretty fall grasses. Our econd attempt was traveling down Goose Valley Ranch Rd, which was a lovely drive but ended at a locked gate of Fruit Grower Supply land. There were an abundance of deer along that roadway, with many bedding down in the midmorning light. 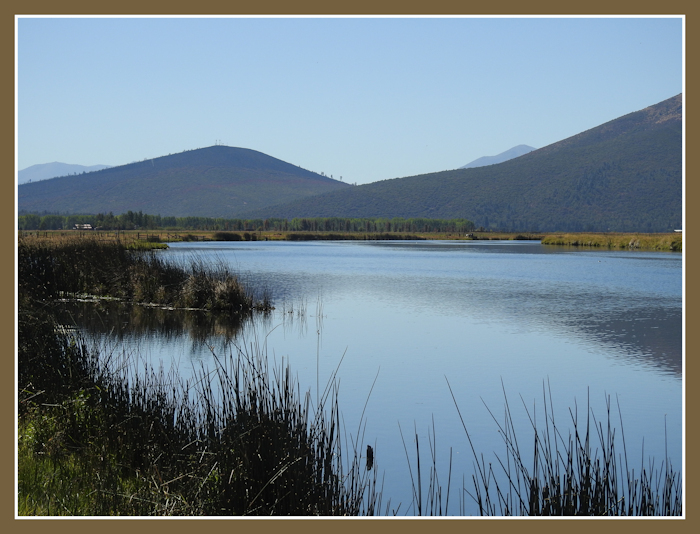 Abandoning the hunt for Lake Margaret, we decided to take Black Ranch Rd over to Lake Britton, cross over the dam and go north on Highway 89 to the MacArthur turnoff. Again, a lovely midmorning drive starting on heavy forest and descending into ranch and farm land. Fall River valley is home to wild rice production. It also attracts a great number of birds - most of which were not cooperating with me at all. Once at MacArthur, we drove north on 'Main Street' past the east end the the fairgrounds. This road becomes gravel and behind the fairgrounds it breaks into two sections. 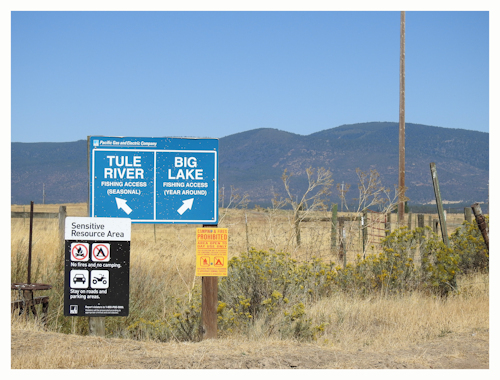 One to the west goes to the Little Tule River fishing area. There is a restroom and parking at the end of the road, but zero shade. It's quite a lovely and wide river, with waterfowl making themselves at home. There is no handicap fishing access here, but it would be a good birding location if you bring your own chairs and umbrella for shade. Backtracking, we then took the other gravel road north (called the Rat Farm Rd on maps) which we knew would end at Big Lake (about 3.5 miles). That brought us to the Ahjumawi Lava Springs State Park. This park is unique in that it requires a boat to actually 'see' the park. 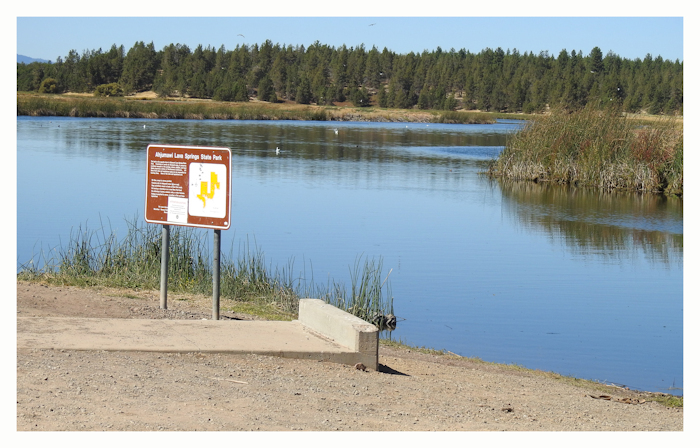 There are trails along the water on a closed roadway that goes from the Little Tule River fishing area to the Big Lake location, and then another trail continues along another closed roadway towards the Big Lake. Neither trail appears to be handicap friendly and are almost inaccessible even for a trail entrance. The finger of water that comes to the parking area is still pretty, and I imagine the park itself is quite magical. If you have a non-motorized boat, you'll want to explore this place. Again, there is zero shade here. There is a handicap accessible rest room, parking and a sort of handicap boat access platform, though I can't see how it could possibly work to get a handicap person into an actual boat. This particular park is very popular with kayakers and canoe fans. There is a large bird population, including bald eagles. But again, there is zero shade on the Park entrance side, though there appears to be lots of trees across the lake on the north side of the park. 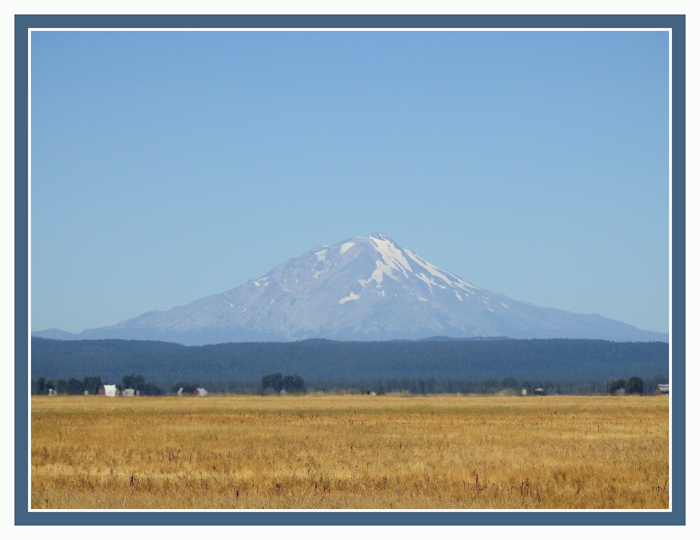 You do get some absolutely spectacular views of Mount Shasta, and with a long lens and a good sunset, it would be worth the drive just for the unique perspective of that iconic mountain. There were a lot of hawks around, but I never got a 'keeper' shot, so we'll have to try, try again. Basically, I'll need to use some binoculars to spot a hawk on a post or pole, park, and get my photo from farther back. The birds have about a 200' range, meaning they fly way if you get within about 200 feet with a car. Byt the time I could see there was a bird on a post I was too close, and away they flew! By this time it was well past noon. We drove back to MacArthur then west to Fall River Mills. Just on the west side of the Fall River is Long Street. The community park is right there, but keep going down Long St as it turns into a very nice 'PG and E Day Use Area'. This area is part of a hydroelectric project. There is a created lake (Fall River Lake) and the Day Use area has several locations for picnics, swimming and fishing along the western edge to the lake. We found one with some shade and a rest room. 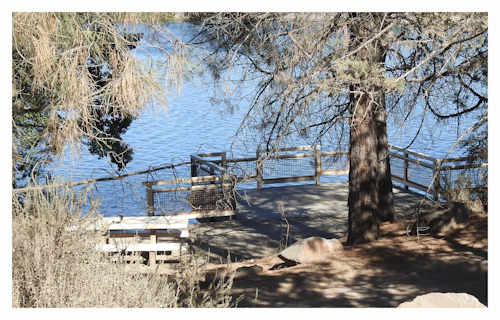 There was a paved trail to the picnic table and a handicap accessible rest room. At another spot there was a handicap accessible fishing platform. At the end of the road was a group picnic area, covered for shade, with swimming areas, though I didn't get out to check for accessibility. There were a number of birds, and it would be a great area for afternoon photos as you'd have the sun at your back. After our very pleasant lunch at the Day Use area, we made the fun find of the day. We drove south on Long Street, crossed over Highway 299E, crossed the bridge over the Fall River, and then turned south on the Cassell Fall River Rd. There is a bridge that crosses over the Pit River. Just on the south side of the Pit River, there is a PG and E parking area (with restroom) and a trail head. And, a WATERFALL! Yes, from that viewpoint you can see a very nice waterfall cascading down the opposite hillside, essentially the meeting of Fall River and the Pit River. I understand that sometimes there is very little water flowing down Fall River, but on this day, it was very lovely indeed! Who knew? It's not in any of the waterfall guides I've seen, but it was certainly pretty - and completely unexpected! There is a trail head here, too. We didn't walk any of it, but another time we'll see just how passible it might be. Again, it's not on any of the trail maps I've seen, but the signage implications at that little rest area was that the trail may go down to the Pit River. We travelled on over to Cassell, going across the edge of a wildlife area in the lava zone. The Hat Creek Rim Rd (USFS) ties into the Cassell Fall River Rd along here. There is a lot of red and black cinder areas making interesting contrasts in colors and terrain. Once through Cassell we stopped by Baum Lake to see if the fall bird migration was underway. There must have been 30 pelicans there! There were also more fishermen than I've ever seen at Baum Lake! And on a Monday - who would have thought? So we didn't stay long as the birds were all well away from my favorite photo locations. My husband and I stopped in Burney for dinner at our favorite restaurant, Anna's Country Kitchen, and had an absolutely fabulous meal of Calimari steaks. It was an absolutely wonderful day of exploration. 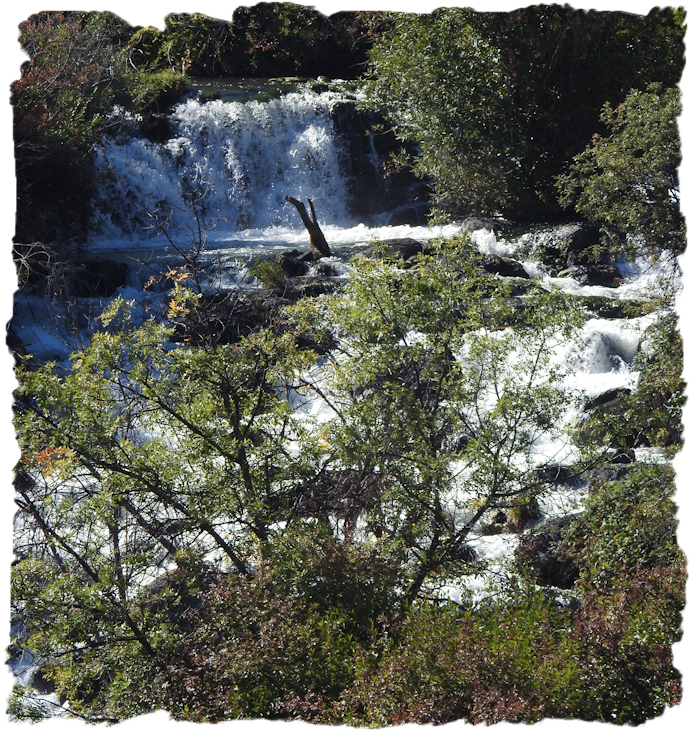 I'll have to say the highlight was finding a 'new' waterfall, and the nice day use are in Fall River Mills. We'll be back!